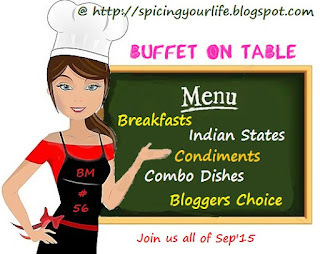 We at #Blogging Marathon try to bring to you a variety, a variety in our various marathons. This one is no different, aptly called “#Buffet on Table “ this week our quest is to bring you different combos from in India. The cuisine of #Karnataka is one of the oldest surviving cuisines and traces its origin to iron age – ragi and is mentioned in the historical works by Pampa Maha Kavi, sushrutha, etc. Although the ingredients differ from one region to another, a typical Kannadiga Oota (Kannadiga meal) includes the following dishes in the order specified and is served on a banana leaf: Uppu (salt), Kosambari, Pickle, Palya, Gojju, Raita, Dessert (Yes, it is a tradition to start your meal with a dessert – Paaysa), Thovve, Chitranna, Rice and Ghee. After serving ghee to everyone, one may start the meal. This is done to ensure that everyone seated has been served all the dishes completely. What follows next is a series of soup like dishes such as Saaru, Muddipalya, Majjige Huli or Kootu which is eaten with hot rice. Gojju or raita is served next; two or three desserts are served; fried dishes such as Aambode or Bonda are served next. The meal ends with a serving of curd rice. There is some diversity in core food habits of North and South Karnataka. While northern-style dishes have jola and rice as the primary cereals the south uses ragi and rice. Come and join me in in my #Karnataka Thali today with # Avrikai Palya, #Saaru and #Higreeva along with #Chapatti and #Rice. Yogini Acharya liked this on Facebook. Tammy Railton liked this on Facebook. Rajani Sivaram liked this on Facebook. Ajay Kale liked this on Facebook. Sharmila Rao liked this on Facebook. Laxmi Devareddy liked this on Facebook. Vaishali Sabnani liked this on Facebook. Omg, feel like having this thali rite now, seriously you rock Archana, i dont have this much enthu to make thalis and you guys are seriously awesome. Wonderful spread of dishes in this platter.Well made. That’s such a feast Archana..I notice that sweet bowl is bigger than the rest, agree on that..:)..I enjoyed all your thalis..wow such wonderful efforts yaar! Simple and comforting Karnataka thali Archana. That is one comforting and yummy oota. Love hayagreeva.